Guava Juice is the new project sprung from the combination between Mr.Bobcat and Tweneboa. The live performance is performed by a guitar and voice duo, a very intense interpretation, the setlist is varying from reggae to soul up to R&B shades. The duo started to work together during the recording of Familyman, one of the track included in Tweneboa's album "The Answer". 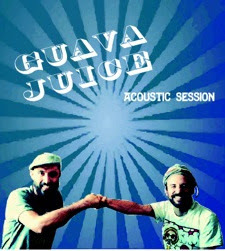 Guava Juice is collecting several collaborations with some of the most representative reggae artists and Djs in Italy (Teo Rootical in Milan, Vale Dj in Turin). The aim of the project is to revamp in an acoustic key the original tracks of the duo and a reconsideration of some of the most beautiful Carribean Soul tunes. Guava Juice e' un nuovo progetto targato Tweneboa e Mr. Bobcat. con una setlist variegata che spazia dalle sonorità Reggae a quelle Soul/R&B. Familyman, uno dei brani del disco "The Answer" di Tweneboa. entrambi gli artisti, rivisitando qualche brano della scena Carribean Soul.